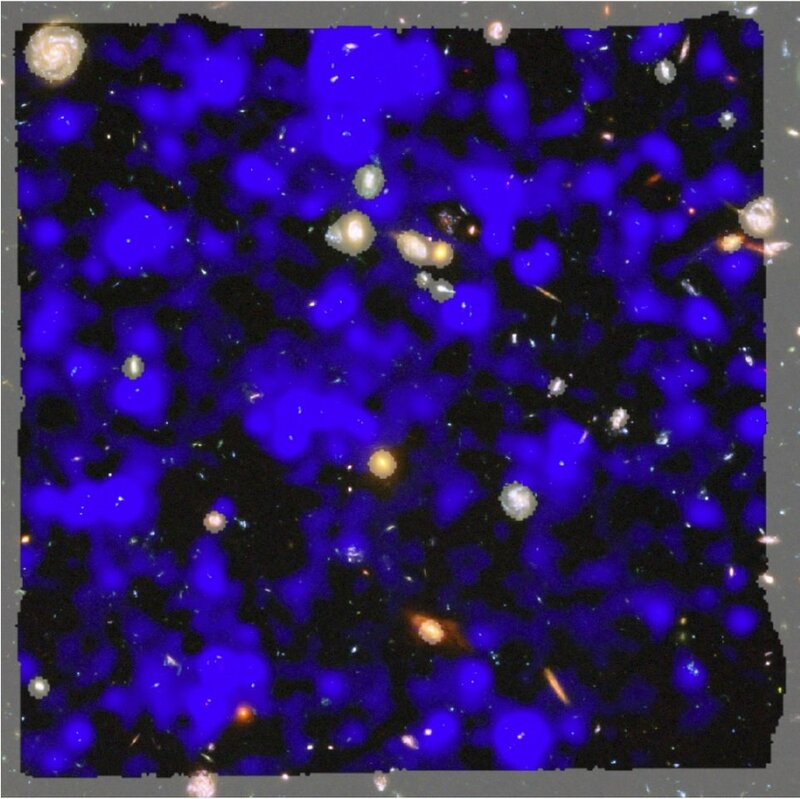 Deep observations made with the MUSE spectrograph on ESO’s Very Large Telescope have uncovered vast cosmic reservoirs of atomic hydrogen surrounding distant galaxies. The exquisite sensitivity of MUSE allowed for direct observations of dim clouds of hydrogen glowing with Lyman-alpha emission in the early Universe?–?revealing that almost the whole night sky is invisibly aglow. Credit: ESA/Hubble & NASA, ESO/ Lutz Wisotzki et al. A study published recently in Nature has revealed the presence of a hitherto undetected component of the universe—large masses of gas surrounding distant galaxies. An international team from some 10 scientific institutions has shown that almost the whole of the early universe shows a faint glow in the Lyman-alpha line. This line is one of the key “fingerprints” of hydrogen. This detection reveals the existence of extensive masses of gas around primitive galaxies. The results of this study are based on observations made with the MUSE spectrograph on the Very Large Telescope (VLT) of the European Southern Observatory, Cerro Paranal, Chile. The principal investigator of the research, Lutz Wisotzki, of the Leibniz Institute of Astrophysics in Potsdam, Germany, recalls that when he presented this image for the first time at a conference a year ago, a colleague exclaimed, “Twenty years ago there was no Lyman-alpha anywhere, but now it’s everywhere!” The high sensitivity of MUSE has revealed that Lyman-alpha emission covers the whole sky, including the apparently empty spaces between the galaxies. “While the Hubble Space Telescope shows us light only where there are galaxies, and between them we do not see anything, only empty sky, MUSE in Lyman-alpha shows light wherever we look,” explains Ana Monreal-Ibero, an IAC researcher and a co-author of the publication. This instrument has also allowed researchers to obtain information about some of the faintest galaxies known, too faint to be observed with the Hubble.